If you're ready to step up your Arduino game from older 8-bit/16MHz microcontrollers, the ATSAMD21 is an awesome alternative. 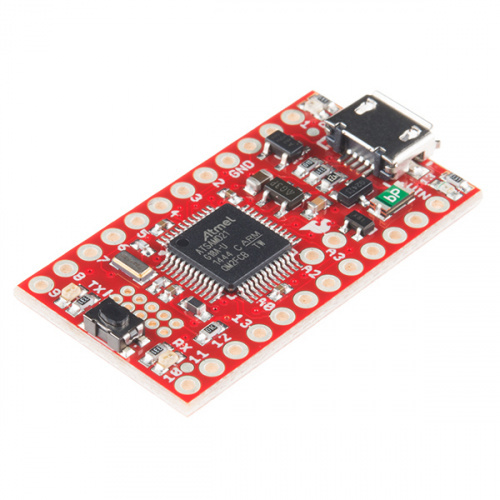 The ATSAMD21G18 is an ARM Cortex M0+, 32-bit microcontroller that can run at up to 48MHz, and it comes complete with 256KB of flash memory and 32KB of SRAM. Plus, best of all, it's fully supported in the Arduino IDE! SparkFun has come up with two new breakout boards for the ATSAMD21G18, both coming in familiar shapes. There's the full-size, Arduino-shaped SAMD21 Dev Breakout. And the minuscule, Pro Mini-shaped SAMD21 Mini Breakout. Both boards have similar feature sets -- they equip the ATSAMD21G18 with a USB interface for programming and power, then surround it with an RTC crystal, 600mA 3.3V regulator, and a variety of other components. The Dev Breakout's extra PCB real-estate leaves room for extra GPIO and an integrated LiPo charger. SAMD21 Overview -- An introduction to the SAMD21 microprocessor. Highlights of some of the µC's most unique features. Hardware Setup -- How to power, assemble the SAMD21 boards. Plus driver installation for Windows users! 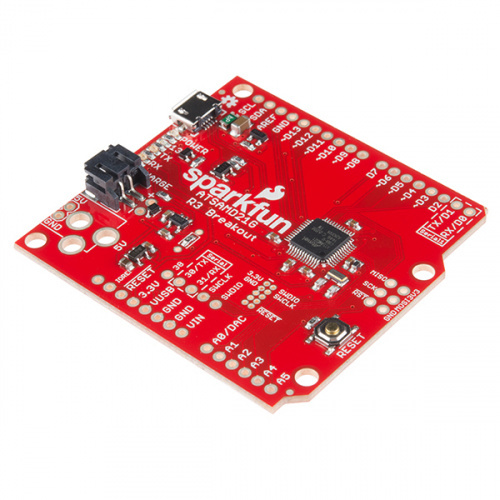 Setting Up Arduino -- How to set up support for the SparkFun SAMD21 boards in the Arduino IDE. Example Sketches -- Simple Arduino sketches to help demonstrate some of the unique features of the SAMD21. Blink -- Blinking an LED is the classic starting point for learning how to program embedded electronics. It’s the “Hello, World!” of microcontrollers. Serial Ports -- Learn the difference between Serial, Serial1, and SerialUSB. Analog Input and Output -- Plotting the DAC output with an ADC input. Real-Time Clock (RTC) -- Using the RTC to create a serial-controlled alarm clock. Troubleshooting -- Tips for working around some of the SAMD21's quirks. This is a 6-pin female header, with extra long legs -- great for stacking Arduino shields. Pins are spaced by 0.1". If you have a SAMD21 Dev Board, you can take advantage of its LiPo charger with a single-cell Lithium Polymer battery, and/or solder a PTH Barrel Jack in to power it with a 5V Wall Adapter.